The respect for Rob Blake as a player and person was on full display Friday in San Jose as the captain of the Sharks announced his retirement following 20 seasons as a defenseman in the NHL. Evgeni Nabokov and Patrick Marleau, pending free agents who could be looking for new homes come July 1, were sitting in the front row with Joe Thornton and Devin Setoguchi. Nelson Emerson, Glen Murray and Tony Granato, three of Blake's close friends and former teammates, were also in the audience. Sharks coach Todd McLellan gave his praise and congratulations by phone, saying Blake leaves a standard of excellence for the Sharks to live up to. Hockey Canada President Bob Nicholson did the same, calling Blake a role model for the hundreds of thousands of kids playing hockey across North America. Luc Robitaille, Blake's former teammate and now a front-office executive for Los Angeles, released a video on Kings Vision congratulating Blake "on an amazing career." Joe Sakic, with whom Blake celebrated a Stanley Cup in 2001 and an Olympic gold in 2002, was seen and heard on a video message. "I'm proud to have said I had the opportunity to play with Rob Blake," Sakic said. Blake was proud to say he had the pleasure of playing in the NHL, of making his dream as a youngster from Simcoe, Ont. come true. His career, including his Norris Trophy in 1997-98, seven All-Star Game appearances and 777 points in 1,270 regular-season games, far exceeded any expectations he set for himself 20 years ago. But Blake also knew roughly halfway through this past season that he was nearing the end of the road. He said it didn't take him long after the Sharks were beaten in four games by the Chicago Blackhawks in the Western Conference Finals to come to grips with reality. "Physically I probably felt as good as I felt at the end of the playoffs, but a lot of that has to do with the medical staff in San Jose and what they do to allow you to play at that level," Blake said. "But it just seemed like the right time. I've enjoyed the 20 years, and it's time to move on to the next step in hockey." 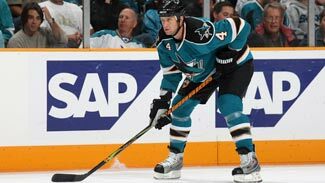 Blake insists that he will be back in the game in some capacity -- Sharks GM Doug Wilson told Blake's wife, Brandy, "when you get a little tired of him being around the house, give me a call and we'll find something to keep him busy." However, Blake's first order of business will be spending time with his family and acting as an assistant coach for his son's hockey team. "I've already been signed up," Blake said. "I got the assistant job, not the head job yet." Blake played all or parts of 14 seasons with the Los Angeles Kings, four-plus with Colorado and the last two with the Sharks. He was traded to Colorado at the deadline in 2001 and went on to win his only Stanley Cup title. A year later he won an Olympic gold medal for Canada in Salt Lake City. He also played in the 1993 Stanley Cup Final with the Los Angeles Kings, losing in five games to Montreal. Among defensemen, Blake is 20th all-time in games played, 18th in points, 10th with 240 goals and third with 136 power-play goals. Blake's most productive offensive season was with the Kings in 1993-94 when he had 20 goals and 68 points in 84 games. He scored a career-high 23 goals in 1997-98. Blake also had 19 points in 23 games with the Avs during their 2001 Cup run. He had 75 points in 143 games with the Sharks in the last two seasons. He is eligible for the Hockey Hall of Fame in 2013. "He's an elite-level player but he has a blue-collar heartbeat," Wilson said. "Leadership is looking someone in the eye and delivering the message that you're going to be there early and do what it takes to win. Rob really epitomized that. You don't speak by what you say, it's what you do, and I sit beside him with tremendous admiration and tremendous thanks. We're going to reap the benefits. His teammates here today, they're going to carry forward the things they learned from (Blake)." Blake debuted with the Kings at the end of the 1989-90 season, ending his three-year collegiate career at Bowling Green University. He played only four regular-season games and made eight playoff appearances, but he became a full-time player the next season and saw action in 75 contests, piling up 12 goals and 34 assists. Blake was selected for the NHL's All-Rookie Team. He played 14 seasons in L.A., serving as the Kings' captain from 1996 until he was traded in 2001. He met his wife, Brandy, in the middle of his first stint with the Kings. "I was fortunate. They gave me the first opportunity," Blake said. "My first partner was (Hall of Famer) Larry Robinson. That's how you learn, from these great players. Tony (Granato) was there. Wayne Gretzky. Marty McSorley. The players I was able to play with in L.A. helped shape my career." Blake played in Colorado until 2006 before opting to go back to L.A. for the start of the 2006-07 season. He played two more seasons there, serving as the Kings' captain in 2007-08 before moving on to San Jose. He was the Sharks' captain this past season. Blake said there are a number of players in the Sharks' dressing room with the tools to take over for him. He specifically mentioned Devin Setoguchi as someone who could eventually wear the "C."
"We have always said here that it's a leadership group. One person ought to wear the 'C' and that will go on, but it's evolved into a group of leaders," Blake said. "You need guys at all different ages to lead and they have taken big, big steps here the last couple of years. I'm pretty confident whoever it will be will take that step and lead this team."